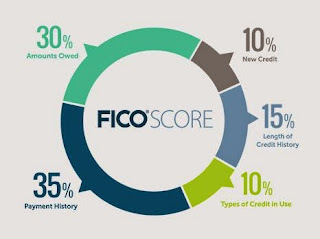 Your credit score (FICO® Score) is a number between 300 and 850. This number is calculated through a formula which takes several variables into account, including, ‘accounts owned’ (30%), ‘length of credit history’ (15%), ‘new credit’ (10%), ‘payment history’ (35%), and ‘types of credit’ (10%). As you see, each variable has a corresponding weight, with payment history affecting your score the most. If you would like a deeper understanding of each category, you can view this information on the MyFico (http://www.myfico.com/CreditEducation/WhatsInYourScore.aspx) website. Your overall credit report is used to factor in the importance of each factor in your credit score calculation. Your credit score is calculated only from information available on your credit score. For a credit score to be calculated, your credit report but have at least 1 account that has been open for 6 months or more and at least 1 undisputed account that has been reported to the credit bureau in the past 6 months. If these 2 things are relevant to you, you should have a credit score. It is a common myth that your current credit score will hurt your chances of getting a loan or new credit forever. As your financial situation changes and new information is added to your bank and credit bureau files, your credit score will change gradually. To begin improving your credit score, there are several steps you can take. A good first step will be to check your credit report. Since your credit score is calculated based on your credit report, you should review your credit report to make sure the information there is accurate and contains no errors. If you made a payment on time but it appears as late on your credit report, you should get that resolved immediately. Also confirm that the outstanding amounts that you owe are correct and up to date. If you find any errors on any of your three credit reports, be sure to dispute them to the credit bureau immediately. Several other ways to improve your credit score include- reducing the amount of debt you owe, keeping the balances on credit cards low and setting up automatic payments or payment reminders to ensure timely payments. You can find more great tips on improving your credit score at http://www.myfico.com/CreditEducation/ImproveYourScore.aspx. Once you are able to raise your credit score you will be able to receive lower interest rates on new loans and credit cards, have more credit available to you and will appear to be a better candidate for a job or new apartment.